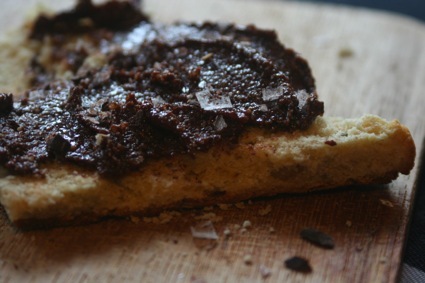 Because it’s World Nutella Day, we figured we’d celebrate by making our own. This recipe is a classic in the Foodie Underground kitchen, and is great on scones, apple slices, and even stirred into ice cream. Vegan and gluten free of course. Warning though: it’s hard not to eat the whole batch. Put all ingredients in food processor and mix until a spreadable consistency. Pour into an airtight container and store in refrigerator. Is 'Artisan' the Greenwashing of the Food Movement? Wtf is Chocolate Sea Salt? This sounds amazing! How long does it keep in the refrigerator? Hi Aly – Mine never lasts longer than a week because I eat it up 🙂 but it’s good up to about 2 weeks or so.